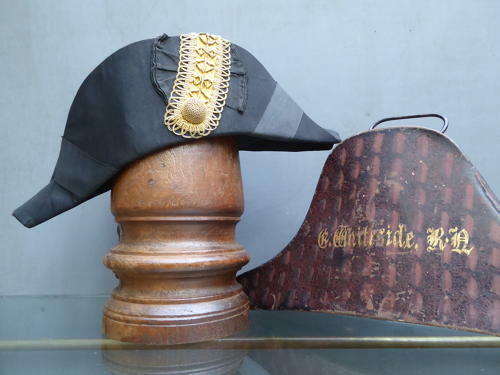 A exceptional example of a Royal Navy bicorn hat in its original toleware case. A wonderfully complete example, the hat with its intricate brasswork detailing comes incased in a beautifully shaped toleware tin with a hinged lid, original paintwork & gilt labelling. The hat itself of the highest quality & labelled 'Ede & Ravenscroft' who were established in 1689 & remain the absolute pinnacle in tailoring to the Royals, military & judiciary, holding all three Royal Warrants. The name C Whiteside requires further research at the time of going to press & although by no means confirmed, it appears he could have been a 'stoker' for the Royal Navy during the Edwardian period. Wear commensurate with age, good original condition, untouched with fading to the label inside the hat & the old Southern Railway travel label to the outer case now delicate & fragile.